My name is Paula Walton. I’m a working craftsperson. I’ve been self-employed since 1986, when I started selling the items that I make under the name A Sweet Remembrance. Among other things, I am a doll maker, a dressmaker that specializes in reproduction women’s and children’s clothing, maker of spun cotton ornaments and holiday figures, and a freelance designer. Upon occasion I write magazine articles and am a Craftsperson in Residence. I teach and do demonstrations quite frequently, plus I was previously the director and curator of a small museum in Connecticut. A reproduction Izannah Walker dolls that I have made. A full set of comprehensive measurements for this head, plus 1 additional head, is included in the sculpting section of my class. A reproduction Izannah Walker dolls that I have made. A full set of comprehensive measurements for this head, plus 1 additional head, is included in the sculpting section of my class. Bonnet pattern is not included in class instruction booklet by instructions are available on the class page. A reproduction Izannah Walker dolls that I have made. A full set of comprehensive measurements for this head, plus 1 additional head, is included in the sculpting section of my class. This is the dress pattern that is included in your class materials. To the best of my knowledge, this is the only comprehensive tutorial on how to make an authentic Izannah Walker reproduction doll and her clothing. I based this class on Izannah Walker’s original patent and two of the nine pre-1873 dolls I own that were made by Izannah Walker. This is a Master Level class that teaches you to make an exact reproduction of one of Izannah Walker’s iconic early pre-patent 18-½ inch dolls. Prior sewing, sculpting and painting experience is a pre-requisite. Why should you buy from Paula Walton of A Sweet Remembrance? The price of this class is $250. As with all my products, the Izannah Walker Doll Class by Mail includes free shipping in the US. Reproduction Alabama Baby made using the patterns and instructions included in my Alabama Baby Class by Mail. Reproduction Alabama Baby made using the patterns and instructions included in my Alabama Baby Class by Mail. The pattern for this set of clothing is not included. For the past decade, I have been making and selling reproductions of Ella Smith’s Alabama Indestructible Babies. 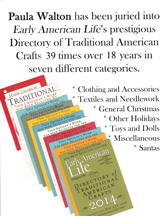 Early in 2007, I was asked by Doll Crafter and Costuming magazine to write a three-part article about Alabama Babies that included full instructions and patterns for making a reproduction doll. The series appeared in the March, April and May 2007 issues of the magazine. Because those magazine issues are no longer available, I have updated and revised my original instructions. They include an additional option for making bare feet, as well as the iconic painted shoes for which Alabama Babies are so well known. I’ve added more than twice as many color how-to photos to the step-by-step guide and had full size pattern pieces printed (so you won’t have to go to the trouble and expense of making enlargements). To read more about the story behind the articles, please visit my blog, Izannah Walker Journal: Paula Walton’s Doll-Making Notes. Full support and unlimited questions and answers are included with this 30-page tutorial, as they are with all of my patterns and classes. Making a reproduction Alabama Baby is easier than making a reproduction Izannah Walker doll, but it is still a complex and challenging undertaking, so it’s nice to know that you will have some help along the way if you need it. I have also started a class member-only Ning site, with bonus materials, extra photos and the opportunity for you to interact and “converse” with me and other class members. – Full-size patterns for a 22 inch Alabama Baby and an early 1900’s sheer cotton and lace dress. An optional pre-made plaster face mask is available for an additional charge of $59.00. Depending on the time of year, it will take up to three weeks for face masks to dry completely before they can be shipped. The face mask is strictly a time-saving convenience item. All of the instructions you need to make the face mask are provided in the class instruction booklet and I will be happy to give you any additional help you need to make your own face mask through the class member Ning site. When you buy the optional face mask, you are paying me to make it for you. You can save money and have the ability to make additional masks by creating your own original sculpt and mold. * Face masks are only available for Alabama Babies. The antique Izannah Walker doll that this kit is based on is shown on the right. A reproduction Izannah Walker doll made by me using the patterns and composition head that are included in my kits. In the middle is an unpainted composition head that comes in each kit along with patterns and an instruction booklet. Have you always wanted to try your hand at making a reproduction Izannah Walker doll? If so, this kit is for you! My kit will enable you to make a faithful representation of an 18 inch antique Izannah Walker doll. This new kit is less challenging than my Izannah Walker Doll Making Class, which teaches you to make Izannah’s traditional pressed cloth heads. Composition Izannah Walker head and shoulderplate made from a mold taken directly from one of my antique Izannah Walker dolls, plus instruction booklet and patterns for both the doll body, a full set of undergarments and two dresses. Instead, the kit comes with a molded composition head, cast in a mold made directly from Isane, an antique Izannah Walker doll in my collection. Also included in the kit are patterns for the doll’s body, under garments and two dresses plus a 31-page instruction booklet filled with detailed color photographs. This kit is suggested for experienced seamstresses who are also well versed in painting with oils. If you do not feel confident enough to paint the doll’s head yourself, you may commission me to paint it for you. This will require at least an additional two weeks. Please take note of the approximate shipping times. This is a new venture for me and I do not have an accumulated stockpile of molded heads, so I appreciate your patience with the four-week lead time. * Dollmakers who sell their works may sell a finished doll made from this kit as long as the doll and advertising materials clearly credit Paula Walton/A Sweet Remembrance for the molded head, patterns and techniques used to make it, and the doll is clearly marked as a doll made by you from a kit. Once you have purchased one full kit, more heads may be purchased to make additional dolls. You are not authorized to make molds of any kind from this head. Doing so would be a copyright violation. This kit comes with a molded composition head, cast in a mold made directly from Isane, an antique Izannah Walker doll in my collection. Also included in the kit are patterns for the doll’s body, under garments and two dresses plus a 31-page instruction booklet filled with detailed color photographs. Please note this Kit is made to order and will not ship from my studio for at least 5 week after you place your order. This kit is suggested for experienced seamstresses who are also well versed in painting with oils. This kit comes with a molded composition head, cast in a mold made directly from Isane, an antique Izannah Walker doll in my collection. Also included in the kit are patterns for the doll’s body, under garments and two dresses plus a 31-page instruction booklet filled with detailed color photographs. The kit is suggested for experienced seamstresses who are also well versed in painting with oils. If you do not feel confident enough to paint the doll’s head yourself, you may commission me to paint it for you. This will require at least 7 weeks. For those of you who live too far away from CT to attend one of my classes in person, I have come up with a class kit. The kit contains 20 pages of instructions, which include 40 photos and list of sources for materials. Along with the instruction booklet, you will receive samples of materials to aid you in your shopping, samples of spun cotton ornaments in various stages of construction, and enough bulk materials for you to make several complete ornaments. New! At no charge for all past and new students of this class, I have created a private Facebook support page. It is the preferred place to ask questions, share photos, learn new techniques, get project ideas, and more. New students are invited automatically. Past students should contact me for instructions. In addition, students may call or email me with any questions. There is no limit to the number of questions you may ask, and no expiration date. For your convenience, I also sell an optional Set of Five Push Molds for Spun Cotton Ornament Faces for an additional fee. I also have a blog to share notes, information and photos of spun cotton ornaments. It is called spuncottonornaments.com. Please check it out! This kit contains 20 pages of instructions, which include 40 photos and list of sources for materials. Along with the instruction booklet, you will receive samples of materials to aid you in your shopping, samples of spun cotton ornaments in various stages of construction, and enough bulk materials for you to make several complete ornaments. New! At no charge for all past and new students of this class, I have created a private Facebook support page. It is the preferred place to ask questions, share photos, learn new techniques, get project ideas, and more. New students are invited automatically. This is a set of molds that you can use to make faces for your Spun Cotton Ornaments. The molds are taken directly from antique doll heads that I own using silicone mold putty. The face-masks produced with this set of molds range in size from 1 inch to 2-1/4 inches. Sold only as a set; individual molds not available. If you are buying my Spun Cotton Ornament Class by Mail, the class does contain instructions on how to make your own push molds. These molds are an optional, time-saving aid. This is a set of molds that you can use to make faces for your Spun Cotton Ornaments. The molds are taken directly from antique doll heads that I own using silicone mold putty. The face-masks produced with this set of molds range in size from 1 inch to 2-1/4 inches. Sold only as a set; individual molds not available. If you are buying my Spun Cotton Ornament Class by Mail, the class does contain instructions on how to make your own push molds. These molds are an optional, time-saving aid. Tiny Cut Out and Stitch Dolls. Every now and then around the holidays I get the urge to work on a fast, fun project! When my most recent urge hit, my mind immediately leapt to the great printed cloth dolls that were popular in the late 19th and early 20th centuries. I’ve always been very fond of all of the printed cut and sew dolls from that era. Here are my versions! They are a combination of printed cloth dolls and photos of some of the antique dolls in my collection. Most of my printed dolls are 8-1/2 inches tall. The exceptions are noted below. Each doll panel that you buy includes two mirrored doll images, so that you can sew them together back to back, or use them separately with a plain fabric backing, or for applique work. The dolls are printed on high quality 100% cotton fabric and are completely washable. There is extra fabric surrounding each doll that will allow for a ¼ inch seam allowance. The dolls may be sewn with right sides together, turned and stuffed, machine stitched from the front side, trimmed and stuffed, or appliqued onto other projects. They may also be cut out and used for journaling and other multi-media projects. Add bits of fabric, lace, crepe paper and Dresden trims to create doll clothing. – Sew back to back for Christmas ornaments, so the “front” side is always on view. – String together into a banner to hang across mirrors, windows or mantles. – Hang individually from cupboard doors or chandeliers. – Make into a mobile. – Stuff with lavender and use as drawer and closet sachets for your finest linens and clothing. – Fill with cedar shavings and place among your doll and bear collection to repel moths. – Special party favors for your doll club meetings and events. – Make into a special doll’s doll for your favorite plaything. – Add a squeaker inside to make a fun dog toy or fill with catnip for your kitten to play with. – Applique’ onto quilt blocks, pincushions, curtains, aprons, pockets, baby bibs and clothing, tote bags, t-shirts and more. Priced individually or discounted if ordered in groups. Cut and Stitch Fabric Doll Panel.